I have to come clean about something. While most of the time I’m 100% happy with all the healthy things I eat on a daily basis, sometimes I’m jealous of what others can eat seemingly without the same consequences my body would suffer. Eat a giant coffee shop muffin for breakfast and I’d surely develop a muffin top. In a matter of hours. Multiple daily swipes from the office candy jar, ordering dessert at lunch, a venti mocha frappuccino with whip? I wouldn’t be lookin’ too hot, nevermind how I felt. But wouldn’t it be nice to indulge? I can’t deny it. 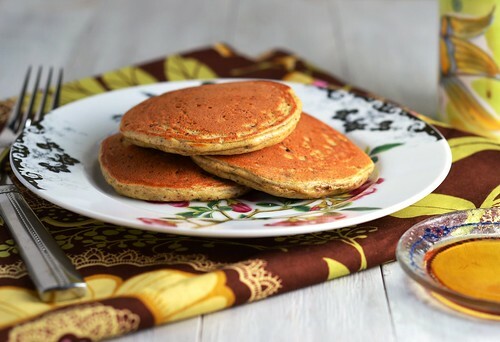 But there’s one treat I probably eat more often than most people I know, and one that screams enough indulgence that I get a little giddy every time I eat them: pancakes! You probably wouldn’t believe how often I eat pancakes. You probably wouldn’t believe how healthy MY pancakes are. And even if you did, you certainly wouldn’t believe how good they are. Well, I hope would actually – you trust me, right? For a long time now I’ve been making my perfect protein pancakes with a few simple main ingredients: an egg, cottage cheese, and protein powder. It might sound weird, but it works. And it definitely sounds very dairy-like, and something I shouldn’t be eating any more. I totally shed some tears. And when I pulled myself together I immediately thought of a perfect substitute for the cottage cheese: tofu! Fortunately, the folks at Nasoya had recently sent me some coupons to get reacquainted with their products. I’ve always been a fan of tofu, but I must admit that my repertoire with cooking tofu was rather limited. Which is a shame, because tofu is quite versatile and a lot more than a simple meat substitute for vegetarians; it’s a fantastic low-fat, cholesterol-free protein source who’s production has less impact on the environment than most meat we eat and provides an abundance of vitamins and minerals.On that note, I was happy to incorporate it in my pancakes. These pancakes turn out just lovely. 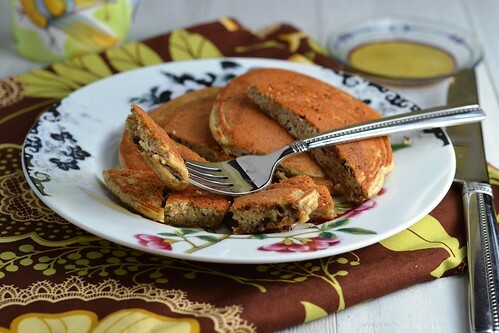 Perfectly pancake-y in that fluffy, buttery way you wish for. Gluten-free and dairy-free, as long as you choose an appropriate protein powder. Healthy and sustaining, with plenty of protein to power you through your morning. I know, I know. Some of you want a grab-and-go breakfast and the thought of cooking in the morning is too much. But I promise these come together much more quickly than you think, and that the few extra minutes you spend will totally make your morning in that “this day is gonna rock” sort of way. As an added treat, I like to throw in a spoonful of cacao nibs. Just because I can. Want to know more about tofu? What kind to buy for what purpose, all the different ways you can use it, and totally yummy recipes? Head over to Nasoya Tofu U, where you can get schooled on all things tofu-related. As an added bonus, if you sign up and pledge to cook tofu once a week for the next month, you’ll instantly receive a coupon good for Nasoya products. If you don’t like free stuff, well, I don’t know what’s wrong with you 😉 And if you already know and love tofu, I have an even better deal for you: tell the great people at Nasoya your funniest story about tofu (perhaps it involves turning a skeptic into a lover?) via Facebook by THURSDAY, DECEMBER 1st and you’ll automatically be entered to win $100. Pictures and videos make great entries too! Keep scrolling after the recipe for a Nasoya Giveaway! *This recipe can be gluten-free and/or dairy-free depending on your choice of protein powder. Preheat a nonstick griddle over medium heat. Combine tofu, egg, protein powder, sweetener, baking powder and cinnamon in a blender and process until smooth (I like to use my immersion blender and the container that came with it.) Stir in cacao nibs, if using. Pour the batter onto the griddle, forming pancakes. Cook for about 4 minutes, or until lightly browned and firm on the bottom. Flip and continue cooking other side, about 2-3 minutes more. Serve hot, drizzled with maple syrup, if desired. Nasoya has provided me with free tofu products, but as always, all opinions are my own. One lucky reader will win a gift pack from Nasoya including 5 coupons good for free Nasoya products and a t-shirt. 3) Share this post on Pinterest, Facebook or Twitter. Leave a separate comment for each share. The contest will close on Wednesday, December 7th at midnight, at which point a winner will be chosen via random number generator. Winner must reside in the United States and comment via DISQUS with valid contact information, which includes an signing in with an email address or Facebook profile where I may send you a message. Winner will be contacted and have 3 days to respond, at which point s/he forfeits the prize and another winner will be chosen. I make a wasabi tofu mayo-ish spread. It's awesome! Just silken tofu with ginger, garlic, soy sauce, rice wine vinegar, wasabi powder, and a little sesame oil. It's a fantastic condiment! Or even just a sauce over rice or quinoa. I eat tofu almost every day anyway… So taking the challenge won't be a huge difficulty. 🙂 I am certainly going to take their challenge, though, and see if I can be accountable! I've made bread pudding subbing the eggs with tofu and came out really nice! Oh – and my tofu trick? Every 'creamy' dip, sauce and dressing gets some silken tofu dropped into it. As a vegan, it gives that wonderful creamy mouthfeel and makes things more substantial without overdoing it on the nuts and nut butters which so many other vegan recipes use – adding often copious fat & calories! I've always been a savory type breakfast girl, but lately I'm craving the sweet! What an interesting healthy twist! Pretty amazing!My most favorite way to eat tofu is your tofu, peanut and kale recipe… I love it! My favorite way to eat tofu is in stir fry! I already pledged with nasoya! I can never figure out how to cook tofu but the pancake recipe looks delicious! Usually I just mix it in with stir fried vegetables if I do eat it. Boring, I know. Chocolate banana tofu pudding! :)Tofu (firm), 1 banana, handfulish of chocolate chips, melted, soymilk. Blend! SO good. I took the pledge! Also, I've been wanting to try these pancakes for a while now, I just need to buy some protein powder. I put tofu in a chocolate pie once which was sort of unexpected. I did not tell people that it was in there! I sub tofu for cheese in lasagna and stuffed shells. I love tofu as a meat replacer in pastas and soups, but I am excited to try this sneaky way of incorporating it into my morning meal. you can! Before I switched to tofu, I was using 2oz cottage cheese. You can also use 1/4 cup oats instead of protein powder – they will obviously have more carbs and less protein, but still a very healthy choice! I used to make them that way all the time (egg, cottage cheese, oats) before switching to protein powder. Not exactly innovative, but I love tofu in stir fry! You are…basically a protein goddess. I get americanos at Starbucks twice a week to get me through class…and I totally think about getting a caramel brulee latte every time. But I don't…because I know what will happen (muffin top squared). And for that many calories..I'd rather have cheesecake.Loving these pancakes! I've really wanted to get into the whole baking with tofu thing. And you've given me the best excuse! I made a gingerbeer battered tofu when I was living in New Zealand. It was amazing. Too bad I haven't found gingerbeer back here yet. who doesn't love pad thai with tofu?! I'd love to see a recipe for a tofu-based dressing! What a creative recipe Cara! I wonder which protein powder works best. I tried making pancakes once with brown rice protein powder and it was a disaster unfortunately. Cara, I love this idea! I am a pancake addict myself. I make them at least once a week (and make double batches to freeze for the rest of the week). They are such a good way to pack some protein in the mornings (if you add the right ingredients, of course, LOL). These look perfect. i am giving this one a try! I like tofu in main dishes, but I like the idea of using it for baking as well. 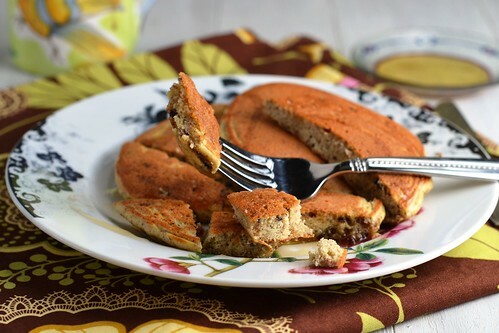 These pancakes look so fluffy and soft, i would devour the bunch, tofu or not! My favorite and unexpected way to eat tofu is in dairy-free egg nog 🙂 Oh wow, so good and you would ever know…at least my husband didn't and drank the whole pitcher. I was pleased :D! I love using tofu to make things creamy: pudding, pie, soup – you name it! My all-time favorite way to eat tofu is BBQ. I have a recipe on my blog, but any BBQ sauce will do. It's so quick and easy and delicious! I like making vegan puddings with tofu! Mmmm I just had tofu curry last night and I like making tofu breakfast burritos! I don't think I have ever tried to use it in a non-conventional way! I should look into the silk tofu or the soft tofu and get creative! Ooooh I love tofu! I see a lot of bloggers baking with tofu and I need to get on that train. My favorite way to enjoy tofu is… any way! I use it as a meat sub all the time. My favorite recipe is one I recreated after eating at The Continental in Philadelphia. They have a tofu tempura avocado meal that is deelicious. I recreated it at home by grilling my tofu instead of tempura and using guacamole. It has so much protein and goodness that I crave it all the time! This week I'll be making a veggie soup with tofu instead of chicken. Shouldn't be too hard to follow this pledge since tofu is already in my diet and this week's menu!! I just shared your post on Pinterest! I like the silk tofu plain with soysauce on top. Have you tried it? It's amazing with rice because the heat warms up the tofu as you eat it. Thanks for hosting this giveaway! I like to press the excess water out of firm tofu and then pan fry it up. Pour a little asian style glaze on it and eat it with rice. Super yummy! I love tofu in thai curry. perfect to sop up the sauce with. yumm! !